The United States Congress designated the Salmo-Priest Wilderness (map) in 1984 and it now has a total of 41,307 acres. 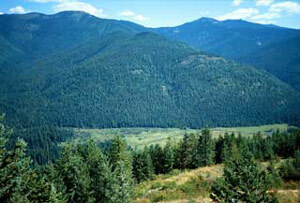 All of this wilderness is located in Washington and is managed by the Forest Service. Tucked among the Selkirk Mountains in the extreme northeastern corner of Washington, the U-shaped Salmo-Priest Wilderness extends its borders along those of Idaho and British Columbia. Its most prominent features are two very long ridges, generally running southwest to northeast, connected near their northern ends by a ridge crowned by 6,828-foot Salmo Mountain. The eastern ridge stands lower, more wooded, more rounded off and more accessible than the steep-sided, rocky-crested western ridge. Streams have cut deep drainages into both ridges. Water from the eastern side of the eastern ridge ends up in Idaho's Priest River. The remaining wilderness drains generally westerly via Sullivan Creek and the Salmo River into the Pend Oreille River. Below the ridge tops of this well-watered Wilderness (at 50+ inches of precipitation annually) you'll find the largest growth of virgin forest left in eastern Washington: western red cedar, western hemlock, Douglas fir, grand fir, larch. The forest houses mule deer and white-tailed deer, elk, black bears, cougars, bobcats, badgers, pine martens, lynx, bighorn sheep, and moose. Though rarely sighted, threatened and endangered species including woodland caribou, grizzly bears and gray wolves also roam through this region. Winter snows may blanket the ground until early July at higher elevations. The Shedroof Divide Trail, the longest path in the area at 21.8 miles, follows the extent of the eastern ridge through open timber and subalpine meadows. It traverses several miles of non-wilderness ridgeline into Idaho, where another 17,585 acres of roadless terrain has been proposed for addition to the Salmo-Priest. The 7.8-mile Crowell Ridge Trail traces the narrower western ridge, offering splendid overviews of trailless backcountry to the north. Several other feeder trails ascend drainages to interconnect the two primary ridge trails. Planning to Visit the Salmo-Priest Wilderness? How to follow the seven standard Leave No Trace principles differs in different parts of the country (desert vs. Rocky Mountains). Click on any of the principles listed below to learn more about how they apply in the Salmo-Priest Wilderness.